Direction fuel injection is the way, and seven of the 10 best engines recognized by Ward's are equipped with it. Direct injection was first utilized in turbodiesel engines over a decade ago. Recent years, though, saw high-pressure gasoline direct injection technology make inroads from luxury cars to entry-level compact cars and full-size pickup trucks. According to Ward's, direct injection, whether deployed in diesel or gasoline engines, "has been proven to reduce fuel consumption and improve low-end torque, which makes for quicker acceleration." "With so many engines featuring gasoline direct-injection and forced induction, we're pleased to have a list that is rich in technology," said Drew Winter, editor-in-chief of Ward's Auto World magazine. "Plus, every engine reinforces the idea that even fuel-efficient vehicles must be fun to drive." 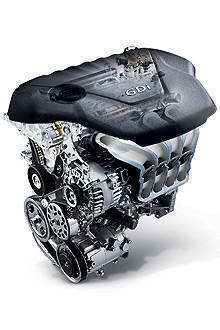 Of the 10 engines, the only ones using conventional multi-port injection instead of the modern direction injection technology are the Infiniti hybrid, the Chrysler Pentastar and the Ford V8.